A July Stay By an Enthusiast! I'm back and a bit more settled, and still I think about how wonderful my stay was in Caussiniojouls. Here as promised is a list of additions to your guidebooks, things I did that I liked, etc. 1) Markets: A) The Pezenas market on Saturdays is terrific: large, interesting, a true market experience, from fish and meats to cheeses, vegetables and fruits; and while the town is a little further from Caussi than other places, the drive is beautiful. B) The Fruitier who sets up shop at the corner of D909 and the road into Caussinojouls sells good fruit. 2) Wine in Faugères and nearby: I have a few to add to the list and a general comment. 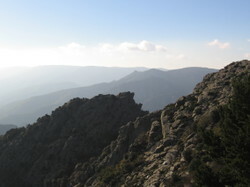 In Languedoc, one calls ahead and makes appointments to visit caves. Also, my tendency on vacation is to pay a little more for wine, which may not be other people's style. B) I wanted to add the name of Domaine Jean Michel Alquier to the list. 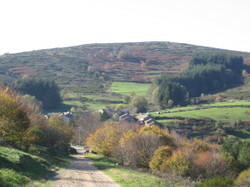 (There are two Alquiers in Faugères, the other Jean Michel's brother Frederic, who still sells his wine under the name of their father Gilbert). I do not know his whites, but Jean Michel's red wines are excellent: big, beautiful, and in need of cellaring. They are not inexpensive. 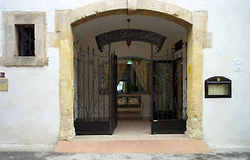 His cave and chateau are in the center of the town of Faugères. C) The other winemaker is in nearby Lentheric. (You may have him on your list, but it's Domaine Leon Barral, who makes really fine wines.). D) I had other excellent wines from the region, in particular white wines from Maxime Magnon (a friend of Barral). 3) Outings: A) The Gorge D'Heric--which is a national monument, I believe. 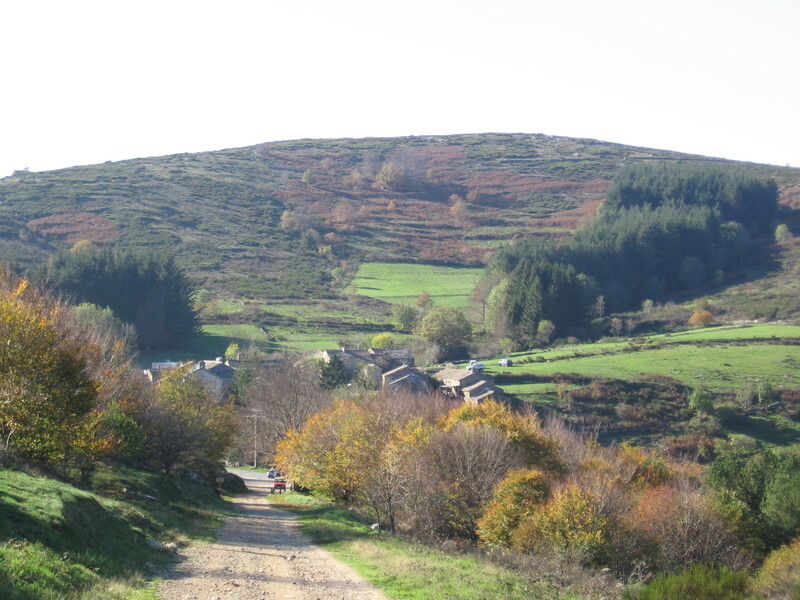 It is a short drive beyond Bedarieux, on the road that travels past Lamalou-Les-Bains and Poujols-Sur-Orb (D908? ), perhaps 35 minutes in total. The Gorge is a beautiful canyon through which a stream of water runs. It's beautiful for its flora, but above all for its numerous swimming holes, some with waterfalls; and while it's popular, if one goes late enough in the day and walks far enough up the trail, it's likely you'll have an entirely private experience. Also, the water is surprisingly warm, much more so than the Mediterranean. 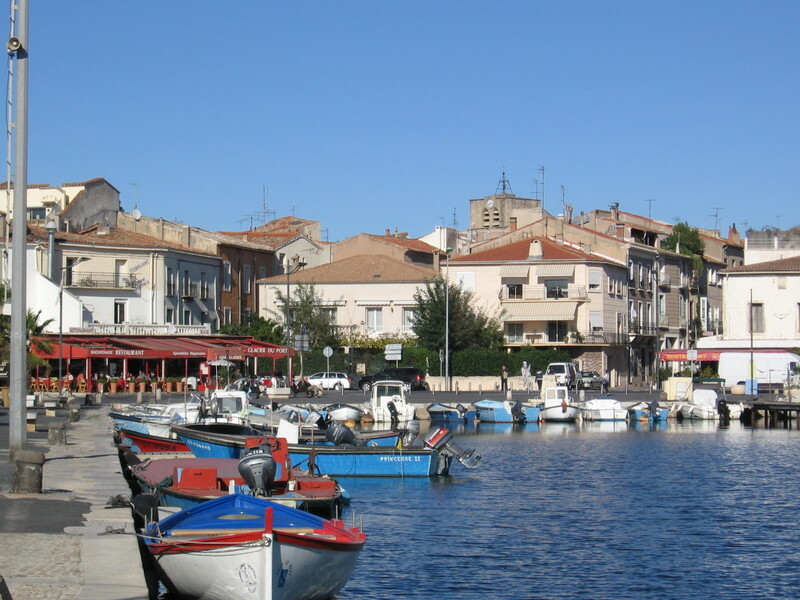 B) Among Mediterranean beaches, I wanted to second the beaches at Serignan, especially the northern edge of those beaches, which do abut a kind of family nudist beach but are beautiful sand beaches without large populations of people. The downside to such beaches is that there are not a lot of amenities. Also, as a general point, I'd recommend people bring a beach umbrella and at Serignan, one may want to bring some kind of windstop or set up towels along the edge of the dunes, to break the power of the winds. (This is not always the case, however, as I learned from someone fishing there.). C) The Gorges and drive to and above St. Guilhem Le Desert. This drive takes you through some beautiful canyon country, past numerous places to canoe and kayak, along small winding roads. St. Guilhem itself is of course interesting for its medieval history, the monastery, and its beauty, so there's a nice combination of history, culture, and the outdoors. 4) Restaurants: A) On the modest end, when I went to pick up someone in Narbonne, we ate at L'Aladdin in Narbonne, a Moroccan restaurant whose tangines were wonderful (e.g. Chicken with Lemon Confit) and who served excellent Moroccan wines, among other wines. The place itself is quite modest in appearance, but the food and the proprietors were great. Also, Narbonne is striking for its Roman history and some of its Renaissance history, especially in the drive along the canal. 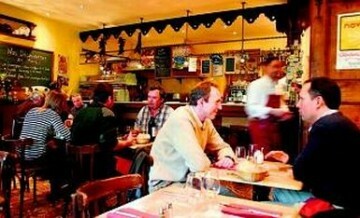 B) L'Auberge de Combes: This restaurant is in your guidebook, and I wanted to second the experience. 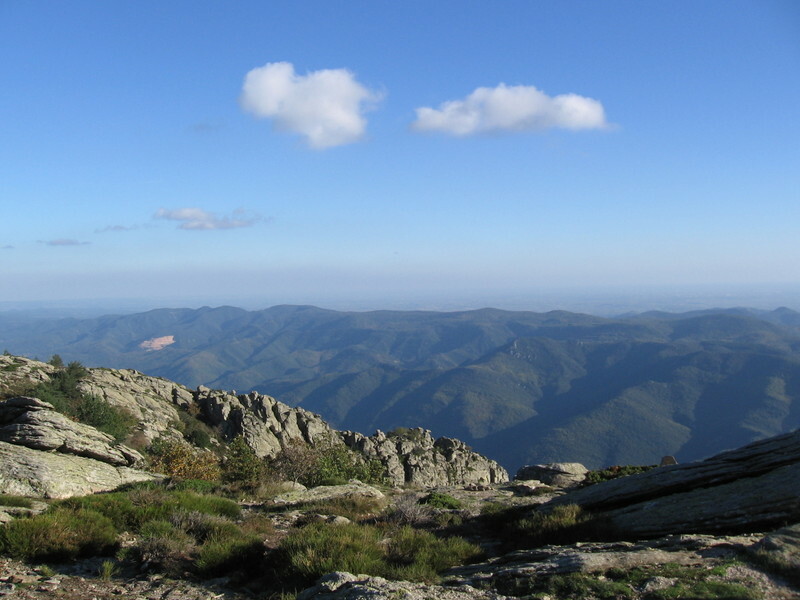 The restaurant is found by climbing into the Languedoc Mountains above Poujouls-Sur-Orb, so a drive in the same direction as the Gorge D'Heric, past Lamalous Les Bains. The road up is all switchbacks, the town beautiful, and the view from the restaurant truly spectacular. The people at the restaurant are really lovely: unpretentious, justly proud of their food and offerings. It is an ambitious restaurant but with slightly less of the formality of, say, L'Octopus in Beziers even if it is elegant. The wine selection is excellent, and the food quite, quite good. It is not inexpensive. C) L'Octopus: In Beziers, L'Octopus is a Michelin one-star restaurant, and so an ambitious, elegant restaurant whose food and wine were both excellent. The service was fantastic too, so while this meal is a splurge, it was great from the amuse-bouche until the final coffee. D) Especially if one is visiting in July and perhaps all summer, be sure to go to the numerous Fetes that the towns of the area have, a celebration of the wines or the summer or Bastille Day. They are informal, often involve live musical performances, and a small carnival-like atmosphere; but each was different. The fete in Laurens was a sit-down meal for 15 euros, with an entertainer in the French chanson tradition; the one in Autignac was 3-5 euros for mussels or french fries or wine; and a rock band that covered American and French hits. 1. L'Auberge de l'Abbaye. Wonderful restaurant in a beautiful setting --about 20 minutes from our house near Herepian. 4 place de l'Abbaye, Villemagne l'Argentiere. Open for lunch Tuesday, Thursday, Friday, Sunday 12:15 to 13:15 h.
in Laurens Serves great Tapas. Open midday Monday to Saturday and evenings (a la carte) from Thursday to Saturday. 3. Le Relais Des Oliviers located at the ‘Karting Centre’ in Caussiniojouls http://www.karting-caussiniojouls.com/index.php? 4. La Forge in Bedarieux. 22 av. Abbe Tarroux, 04 67 95 13 13. Excellent cuisine in a beautiful stone high-ceilinged dining room (with summer terrace --photo on right). (closed Sunday evening and Mondays) Very reasonably priced (we got the Prix Fixe menu last time and it was excellent). 49 90 00, closed Sunday and Monday. Two stars from the Guide Michelin! For the special evening out. This is the more established of the two Michelin-starred places. Pricey, and service is a bit too formal and fussy for us. This place has been going since 2005, and got its first Michelin star in 2008. Despite the rather spartan dining room, it has some of the classiest cooking in Béziers and we much prefer it to l’Ambassade. This outlet of the Michelin-starred Pourcel brothers is a brasserie serving Mediterranean cuisine with an Asian twist. Two-course menus cost from €21. We haven’t been there yet but it’s on our list of “must tries”. 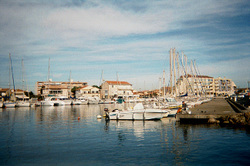 A very up-and-coming place, inspired by Chez Philippe, the celebrated restaurant in Marseillan. French based international cuisine, with plenty of Spanish and Italian touches. Last but not least, this cosy little restaurant is our favourite in Béziers. Traditional French with a few clever modern twists, good value, excellent service, and the most perfectly charming waiter in the world. Hi Susan- we are at JFK, waiting for our last flight home from Caussi and Barcelona and I wanted to tell you what a wonderful week we had at your charming and cozy home in Caussi. 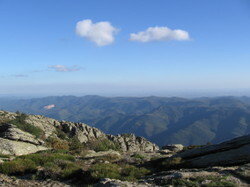 It was a perfect time with lots of wine, good food, most of which we prepared ourselves, incredible views, many of which Sam painted, trips to Roquebrun, Fos, Pezenas, Bedarieux, a great hike up Mt. Caroux, and much more. We spent all day Saturday in Pezenas and appreciated the extra day at your house which allowed us to enjoy the day there at the market. Then, yesterday, we left for Collioure, which was awe-inspiring both in its magnificent coastline and castles, and the fact that we were seeing the same views that Matisse, Picasso and others painted. We loved Barcelona as well, and with our trip to Caussi, it was the perfect combination of yin and yang. I wanted to mention the restaurant , O Bontemps, that we really loved in Magalas. It was very contemporary French, in an attractive, minimalist, modern room. The food was lovely, the owner spoke English, but what made it really work for us was that he was willing and able to accommodate my husband's dietary issues, and we both enjoyed a wonderful meal. So, again, thank you for sharing your fairy tale village with us. It was a vacation we will always remember. Just wanted to let you know how much we enjoyed your Caussi house during our trip to Languedoc in Sept 2011. The house had everything we needed and we really enjoyed the view from the roof-top Terrace; we spent most of our afternoons up there after returning from our daily excursions! As far as tips for future visitors, I will summarize our adventures categorically and hopefully there will be some nuggets there! L'Espiguette - beautiful beach outside of Montpellier near Le Grau du Roi - one of our favorites - 1.5 hrs from Caussi - very remote - bring chairs umbrellas & cooler as there are no services - 5.5 euros to enter & park - long drive but well worth it! Portiranges - the closest beach at 30 mins from Caussi and the one we spent the most time at (3 visits) - You can bring your chairs etc. but you can also rent chairs + umbrella from the Maui Plage station (rents pedaloes, boards & other water sports) at west end of beach - ample free parking - very busy in season - it was nice and empty in Sept.
Avignon - went there to visit a few shops Diane had in mind - interesting city - lots of traffic (cars & people). Took the opportunity while there to visit Tavel (15 km away) and pick up some great Rose Wine to bring back to Caussi (we consider Tavel roses to be among the tastiest in all of France - at least the France we've experienced so far - Provence & Languedoc) to sip on the terrace in late afternoon. Great scenic drive - From Olargues D14 up the mountain to D53 towards Cambron (?) and then back towards Belarieux - beautiful dark pine forests, herds of horses and great mountain views. 2-2.5 hours leisurely drive. O Bontemps in Magalas - made a reservation - on arrival found closed until mid-Sept - confused as to why they took rez?!?!? - anyway we found a little Mom & Pop just down the hill from O Bontemps and had a delightful meal & lots of fun with owners - went back for a second meal on our last night - can't remember name but have pictures of resaturant with name - great pizzas among other things! Le Baroulet in Roujan - beautiful setting in hotel courtyard - food was OK but not great - atmosphere made up for it! All in all it was a great trip. We had beautiful weather. 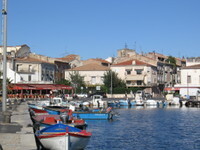 The village of Caussi was charming. It was so quiet, that, if not for the occassional bird chirping or insect buzzing, you might think you'd gone deaf! Talk about great sleeping! I was able to use the cable for the DSL line to call home via Skype so that was very helpful. Made great use of your juicer - fresh OJ every morning! Thanks so much for your hospitality. By the way, you are now the owner of 2 new beach chairs, a new beach umbrella & a new cooler which we found convenient to buy while we were there - hope new visitors use them well! Here are Dylan and Zelda enjoying dinner on the terrace (Aug 08)...The kids loved all the beaches...we went to Serignan Plage (a favorite), Roquebrun (kids loved the stones and cool, clean water). Cap d'Agde beach has a great kiddie play/water park. We found lots of playgrounds as well...one right by the Bedarieux market. Amazingly, they loved wandering around Pezenas with all the fun shops and the ice cream shop that delivers your ice cream cone shaped like a rose! We ate at La Tartine in Pezenas...recommend it. From the Kilbreth family (May 2008): we really enjoyed the Auberge de l’Abbaye in Villemagne. It was exceptionally good—and the wine they recommended was from Caussi! You can get menus starting at 27 euros and going all the way to about 58, so you can make it as pricey as you want. But it’s a lovely spot in a spectacular 17th century Abbey with 1 star cuisine, all based on fresh, local ingredients. Charmante petite auberge de campagne, située dans un village classé, au coeur du Parc Régional du Haut Languedoc. Utilisant une petite partie d'une ancienne abbaye cistercienne, cette auberge bénéficie d'un cadre exceptionnel, voûtes du XIIéme siécle, mobilier en bois massif. Vous y goûterez une cuisine originale et inventive élaborée exclusivement à base de produits frais et locaux. Spécialités : Roulades de Foie Gras aux Figues et Magret sur son croustillant, Etoile d'Anchois de Sète avec sa Poivronnade à boire. Our friend and Marseilles native Marion Dubois strongly recommends La Flambee in Pezenas (27, rue de la Foire) for its warm, casual atmosphere accompanied by a simple menu of homemade pasta, house pizzas, grilled shrimp, and salads, all of incredibly high quality. Very welcoming ambience. 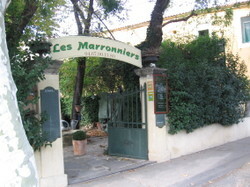 Located in one of charming historic buildings in the heart of Pezenas...Don't miss. We are lovers of any kind of seafood! We ate great fruits de mer and oysters in Cap-d’Agde (restaurant La Reine des Mers) and at Valras-Plage. At St.Pons we enjoyed great local food at a lonely restaurant behind the main street (across the street from the little park at the head quarter of the Parc National du Haut-Languedoc Great place for a French lunch. We loved La Forge in Bedarieux. It had excellent food at very reasonable prices. 22, avenue Abbé Tarroux, BEDARIEUX Tel 04.67.95.13.13. Menus de 15 € à 35€. Menu du terroir à 15 €. 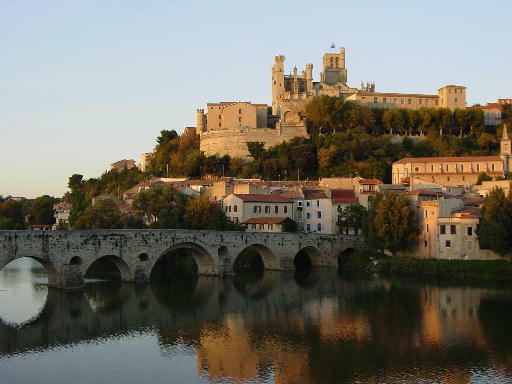 Beziers, a city of about 40,000, is the nearest metropolis to Caussi (about 15 minutes away.) You don't need to go to Beziers to eat well but if you crave a bit urbanity, you can munch on mussels and local wine at one of the cafes in the central market. Or be extravagant and dine at L'Ambassade. Here Patrick Olry cooks ambitious food in an ultracool setting (4 67 76+ 06 24). Framboisier is also good (we love the warm oysters in champagne sauce) (4 67 49 90 00).